A big shout out to one of our valued clients that also has a booth at the Expo. 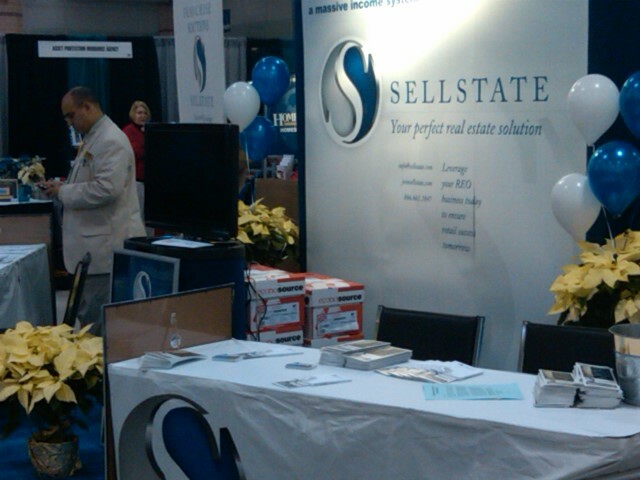 SellState Property Solutions Realty. Visit them at Booth 637. 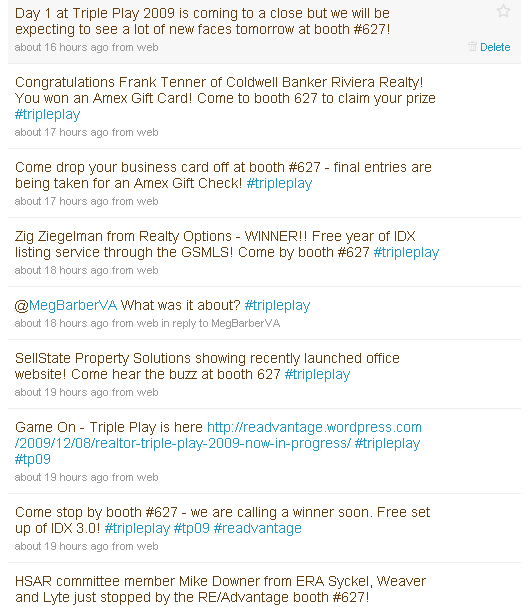 Personal Note: Since this was my first year at Triple Play I was a bit skeptical and uneasy as the REALTORS® started filing in the convention center after their classes. 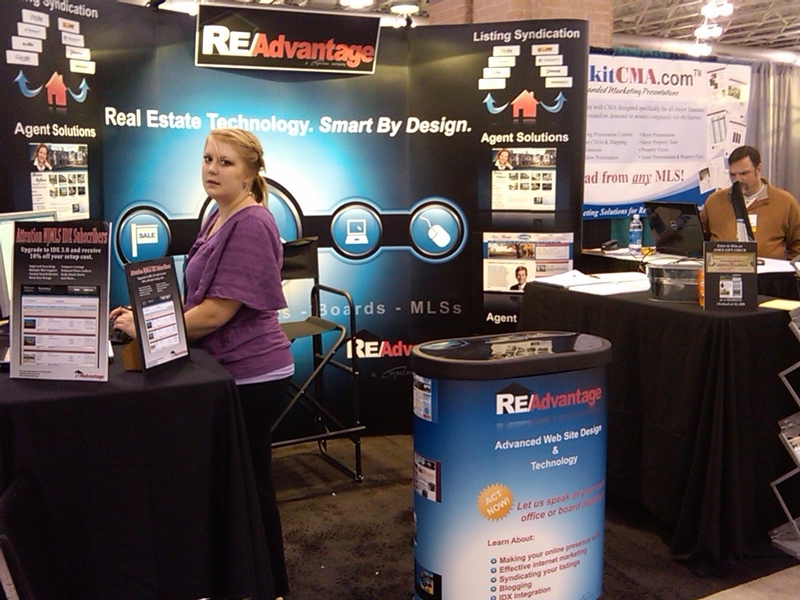 I didn’t know what to expect when a burst of visitors came to our booth but after about an hour I was talking up all the REALTORS® as if I had been in sales for years! I was proud to get a several clients interested in our products enough that I have many follow up calls to make at the end of the week. Overall day one went well and I am more than excited to start day 2! Our Live Twitter broadcast was also a success with many new followers coming online. Remember even if you are not down at the Convention you can still win with our TweetQuiz. Watch out for them throughout the day. As day 2 opens here at Triple Play 2009 at the Atlantic City Convention Center RE/Advantage is ready for the oncoming crowds of REALTORS® we expect to see today. We will be running demos all day and we are interested to answer all questions that come our way. Don’t forget we are still giving away lots of cool stuff, drop by and say hello. Watch us LIVE in Atlantic City. Yes we are now streaming a live WebCast from Triple Play. There are 3 interesting educational sessions happening today. At 9am to 10.15am REALTORS® can attend a class entitled “Connecting with Online Consumers” with Bill Lublin. Another exciting class running from 9am to 11am entitled “Mobile Technology Survival Guide for 2010” with Max Pigman should interest anyone looking for more information on social networking. Then from 10.30am to 11.45am the most important class of the day! – “Understanding Social Media” with Bill Lublin. He will be discussing the top 10 social media questions today as well as the importance of social networking.